Russian senator Arashukov to stay detained on murder charges | Russian Legal Information Agency (RAPSI). 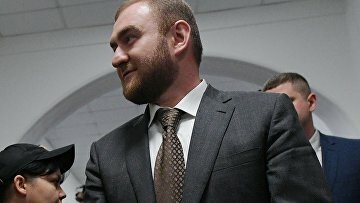 MOSCOW, February 7 (RAPSI) – The Moscow City Court on Thursday upheld a lower court’s decision to place Russia’s Federation Council member representing Karachay-Cherkess Republic Rauf Arashukov, who stands charged with murder, in detention until March 30, the court’s press service told RAPSI. Moreover, he is accused of gang organization and witness tampering. On January 30, Moscow’s Basmanny District Court denied a 10-million-ruble (over $150,000) bail to Arashukov and placed him in detention for two months. Investigators claim that the member of parliament’s upper house was involved in the murder of a Karachay-Cherkessia public youth movement’s deputy chairman Aslan Zhukov and the republican president’s advisor Fral Shebzukhov in 2010. Moreover, investigators believe that Arashukov is implicated to natural gas embezzlement from Gazprom company. The senator pleads not guilty. Arashukov was arrested in the Federation Council on January 30. The upper house of parliament stripped Arashukov of his immunity and gave consent to his prosecution upon an application by the Prosecutor General. 14:59 07/02/2019 The Moscow City Court on Thursday upheld a lower court’s decision to place Russia’s Federation Council member representing Karachay-Cherkess Republic Rauf Arashukov, who stands charged with murder, in detention until March 30.